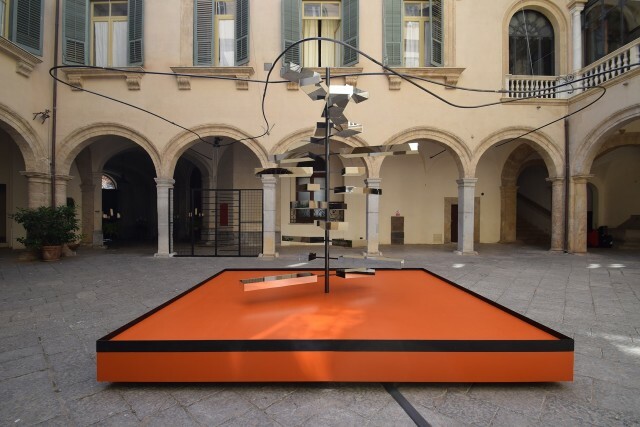 14 JUNE 2018 On the occasion of Manifesta 12 in Palermo, Marcin Dudek presents Giochi Senza Frontiere, a site-specific work in the courtyard of Palazzo Mazzarino. Giochi Senza Frontiere appropriates its title from a pan-European television show that aired from 1965 to 1999, in which European teams competed against each other in a series of playful games designed to reinforce ideas of freedom and unity beyond borders. The utopian vision nurtured by the TV show appears as a distant mirage in the context of the contemporary political landscape that Dudek’s Giochi Senza Frontiere finds itself within; one in which the populist impulse has reawakened in western politics, and the collective values that underpin the European project face challenges from all sides. Building on the thematic of Manifesta 12, which draws on Palermo’s migration problems as emblematic of the wider crisis faced by Europe in 2018, Dudek’s kinetic installation addresses the notion of heritage, identity and narrative as facets of a European landscape in continuous flux. The central component of the installation is a monumental, motorized steel sculpture, set in the middle of Palazzo Mazzarino’s courtyard, slowly rotated by a concealed motor. The sculpture resembles a giant, freestanding turnstile, comprised of twenty-four rectangular armatures each covered with mirrored panels, distributed across twelve horizontal levels. The number twenty-four refers to the quantity of still images needed to create a motion picture of one second’s duration, as illustrated in Eadweard Muybridge’s stop-motion photographic practice in the 19th century. Dudek has equaally structured the rotating edifice to evoke the double helix spiral of a DNA molecule, first observed in 1953 by James Watson and Francis Crick. This discovery provided unequivocal proof that all human beings are universally interconnected, beyond any barrier of time, place, race or politics. The interaction between viewer and artwork begins with the simple act of the visitor’s choosing to enter the Palazzo’s courtyard by passing through an actual functioning turnstile. In doing so, each individual visitor unknowingly triggers the release of a ball bearing, which travels along a network of steel pipes above head height, aligned with the top of the Palazzo’s arches. The pipes curve across the courtyard, ultimately traversing directly above the rotating sculpture. As the ball bearing reaches this point, it is released via a hole in the pipes. Landing on the sculpture’s armatures, each ball bearing progressively smashes their mirrored surfaces. The trajectory of the two pipes traversing the courtyard trace two cartographical routes – ancient and contemporary migratory paths that passed through Palermo. The contemporary path curves from eastern Africa to southern Europe via Sicily, originating in Somalia via Tripoli. The ancient route tracks the first recorded wave of foreign immigration into Sicilywith the arrival of the Vandals in approximately 440 AD. The Vandals were a large East Germanic tribe whose earliest known native location was in present-day Poland, where Dudek himself was born. Turnstiles have featured in Dudek’s oeuvre before, as mechanisms of crowd control and quantification, reducing the movement of masses to individual passage. The London chapter of his recent two-part exhibition, Steps and Marches, funneled visitors into the gallery via a turnstile, the entry point to a show addressing the notion of individual responsibility within group behaviour. Dudek’s interdisciplinary practice examines the dynamics of crowds in a variety of contexts: his 2015 performance Border in Motion explored the ephemerality of national identity conferred by borders whose parameters change from one generation to the next. In the context of Europe in 2018, it is impossible not to read the turnstile’s significance as a mechanism of control and division, separating those who are outside from those who are in. The rotating sculpture’s armatures each measure different lengths, corresponding to contrasting modern and historic statistics relating to European migration. One of the sculpture’s twelve levels illustrates the number of people emigrating from Sicily in 1914 versus the number of immigrants entering Sicily in 2014. Another level weighs Polish emigration against refugee intake into Poland over the past thirty years. This statistic is autobiographically relevant – Dudek’s generation was responsible for the highest levelof emigration from Poland, peaking in 2007, two years after the artist’s arrival in London. Giochi Senza Frontiere expands Dudek’s ongoing investigation into group identity to respond to the historical context of Europe as a landscape whose character has been defined by repetitive waves of cross-cultural migration spanning a timescale of thousands of years. At the outset of its existence, the sculpture is a perfect reflection of the elaborate period architecture of Palazzo Mazzarino. Over the course of its interaction with the public, it undergoes a total transformation, as the ball bearings change its pristine surface into a fragmented reflection of its surroundings – a testament to what was before, unforeseeably impacted by the arrival of each new visitor. Marcin Dudek (b. 1979, Poland) lives and works in Brussels, Belgium. Dudek works with objects, installations, collage and performance, touching upon questions regarding control in society, the hierarchy of power, and mechanisms of violence and aggression as seen from sociological, historical, and psychological standpoints. Dudek’s use of abstraction to deal with these questions amplifies the labor, anxiety and compulsive approach that characterize his process of image production. After leaving Poland aged 21, he studied at the University Mozarteum Salzburg, and Central Saint Martins, London, graduating in 2005 and 2007 respectively. His work has been exhibited internationally at institutions including Moscow Museum of Modern Art, Salzburger Kunstverein, the Arad Art Museum, Bunkier Sztuki and the Goethe-Institut Ukraine. His installation “The Cathedral of Human Labor” (2013) is on permanent view at the Verbeke Foundation in Belgium. Marcin Dudek's site-specific installation Giochi Senza Frontiere, 2018, will open at Palazzo Mazzarino on Friday 15 June as a part of Manifesta 12. Marcin Dudek is represented by Edel Assanti, London, UK Harlan Levey Projects, Brussels, Belgium Leto, Warsaw, Poland Yeo Workshop, Singapore. Special thanks to Marida and Annibale Berlingieri and Lidia and Piervittorio Leopardi. Marcin Dudek, Giochi Senza Frontiere. from Marcin Dudek on Vimeo.